Data in the user, group, and organization objects can be searched. Searching these objects returns user profiles and group and organization summary pages; each of which also lists any associated tickets. Note: Groups and organizations are not available on the Essential plan. You can search users, organizations, and groups by using the search tool that is displayed in the People page. When you search from this page the results are restricted to this people data. If you search using the global search tool, you need to also use the type keyword if you want to restrict results to specific types of data. If you don't, your search results will include matches from the data in your Zendesk Support instance. For more information about using search, see Searching the data in your Zendesk. All the user data properties you can search are described in the tables below. All of the searchable data in your Zendesk Support instance (including ticket data) is described in Zendesk search reference. To search for a user's profile data, you have the following two options. What's the difference between the two? The keyword user when not combined with type is just a shortcut for finding users by ID, name, and email address. The user keyword, like the ticket user role keywords (assignee, requester, submitter), accepts the ID, name, and email address as valid user identifiers. If you want to search for additional user data, such as the user's phone number, the organization they belong to, and so on, you need to use type:user. This example also illustrates the usefulness of type keyword. With it you can search for user data that is shared by more than one user. You can search for users that are in the same organization or group or any of the other searchable user data. For more information about the type keyword, see Using the type keyword. The type keyword is also used to search the group and organization data objects. The user data object contains all of the user properties that you can set in the user profile. Not all of the user profile data is searchable; those properties that are searchable are described in the following table. name The user's partial or full name. role The user's designated role. email The user's email address. group The user's group name. This only applies to admin and agent users. organization The user's organization name. created The date the user was added to your Zendesk. For more information on using date and time in your search, see Searching by date and time. notes All text in the notes field in the user's profile. details All text in the details field in the user's profile. external_id The user's external ID, if used. phone The user's phone number. tags Tags that have been added to the user's profile. 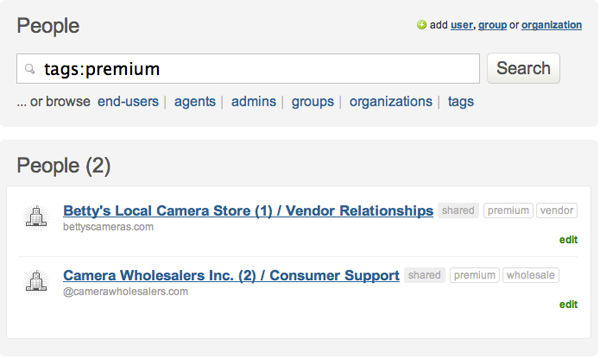 For more information about tagging users and organizations, see Adding tags to users and organizations. For more information, see Searching custom user and organization fields. Here are the group properties that can be searched. created The date the group was added. Here are the organization properties that can be searched. name The organization's partial or full name. created The date the organization was added. details All text in the details field in the organization's profile. tags Tags that have been added to the organization. You can search for data in custom user fields and custom organization fields by using the key that identifies the custom field. To locate the key for a custom field, click the Admin icon ( ) and select User Fields or Organization Fields, then click the name of a custom field. The field key appears in the properties panel on the right. You can search for users and organizations that have no value in a specific custom field, by using none as the search term, along with the custom field key. For instance, if you have a custom field key foo, a search for foo:none returns all users or organizations with the empty custom field foo. Note: You cannot search for data in custom ticket fields the same way that you can for custom user and custom org fields. For custom ticket fields you can search for data in drop-down and checkbox fields based on their tags. For more information, see Searching custom ticket fields. Find users or organizations where product_name contains the multi-word phrase "red widget:"
We are interested in learning how you, Zendesk customers, use the Zendesk search in your work to help us continue enhancing and improving this feature. We will follow up from there if we find a match to our study. Due to limited resource available, we may not be able to cover all customers. Is there a way to search for duplicate end users in Zendesk? We've got end users getting pulled in via API and end users emailing our company directly and at times, it results in a duplicate end user being created. I'd like to be able to easily run a search every so often to get these cleaned up. Suggestions? Zendesk uses the email of the requester to link user information together and no two users in a Zendesk can have the same email address, so there shouldn't be exactly duplicate users in the account. If for some reason there really is multiple users being created with the same exact email or phone number, let us know as that could point to an issue with user creation in your account. Users may have the same name, but their contact information (email, phone #, etc) should be different. You can direct the search a bit to just their name by using (name: "insert name here") in the search field. If you find two users with the same name but different contact information, I'd suggest merging the two together from their user profile page so any subsequent interactions from them will all be linked to the same user account. I am having trouble searching for organizations based on custom Org field values. I created a custom drop-down whose field key is org_type and applied one of the values to several orgs. However I get no results when I search using "org_type:agency", for example. Should I submit a ticket about this? @Mike. It does sound like you're doing everything correctly. We'll need to take a look at your account to verify what might be going wrong, so yes, please submit a ticket and we'll go from there. Thanks! I figured out the problem. I was trying to use the search option on the People screen rather than the main search bar at the top. It works when using the main search bar. Thanks for coming back and letting us know, Mike! What is the query to find all organizations with or without a domain. Is it possible get all the domains associated with it too? You should be able to pull that information using our API! How do you search on Twitter or Facebook handle from the Search bar? Regretfully, it's not possible to search for users based on their Twitter or Facebook handle right now. I'd recommend sharing your feedback in our Product Feedback forum to bring more visibility to this request. You can search for tickets created via those channels by searching for via:twitter or via:facebook, which may help make those users easier to find. how can i search an organization in a full name not in partial name ? Hi Michel! Welcome to the Community! Can you tell me where you're trying to do this search and what search syntax you're using? i have a window application and i am try to check if an organization already exist. sure i am already connected with user and password. society.zendesk.com is actually an internal subdomain so you're not going to be able to get results from that search. Are you sure you're using the right subdomain? Otherwise, I think your query is okay except that I believe you need to use user: "Your Name" rather than name. Is it possible to search by user id or organization id? Where/how are you trying to search? Give that a try and let me know if you have further questions. Any chance you guys enable Search on Organization id? Seems to be a big gap as it can't be searched on - even in your Advanced Search interface in Zendesk. If you'd like to share your use-case, we can provide some additional options for you as well! How Do I search Organizations which has some data in Custom_Field.. something like Not Null. ? What about searching for users that have a null property? I know that doesn't work, but is there a way to do this? Welcome to the Community, Jorge! There isn't a search operator that will do this, but if you can give me more information on what you're hoping to do with that information I may be able to help you find another way to do it. Is there a way to pull the organization name and their group alignment at the organizational level rather than ticket level? If so, I'd greatly appreciate feedback on this for we are attempting to change all organizations over to a new group alignment and need to verify everything is set as expected and continuously audit this. Thanks. What plan level are you on? Hi, Is there a way to pull tickets from multiple groups ? I would like to have a url query that gets all the tickets under Round users OR Square Users. Is that possible ? Currently I am only able to search for one group per query.